We had a great turnout to our November dinner meeting despite the inclement weather. The next New South Wales state election is scheduled to be held on Saturday 23 March 2019 to elect the 58th Parliament of New South Wales. The electorate of Wollondilly spans from Bowral in the South, Warragamba in the North West and Appin in the East. It also includes the wilderness in the west to Yaranderie and beyond. 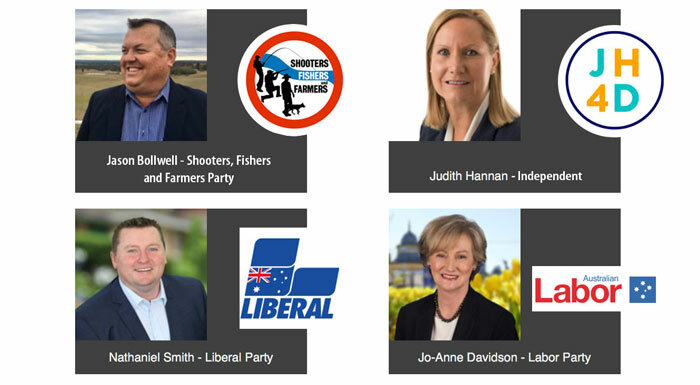 If you live within these boundaries you may be interested to learn who the candidates are for the State election representing Wollondilly residents, businesses and organisations. And what they stand for! Picton Camber of Commerce has invited the candidates to join us for dinner on Wednesday, November 28th and speak to members and attendees. The public was invited to Meet The Candidates at our dinner meeting at the Picton Bowling Club. Tickets were $40 plus booking fee per person which includes mains and desert. Proceeds after expenses will be used to assist the community. Attendees heard from each of the candidates during the night and after dinner, each were asked preselected questions from the audience previously submitted by email. Photography and recording were take on the night and will be published here shortly.